A balance of all four Throughline perspectives guarantees the integrity of a narrative. Many focus on determining the wants and needs of principal players to the exclusion of anything else. They stop on the why and what of individuals, instead of moving on to the more important why and how of the narrative itself. To maintain the integrity of narrative, successful Authors bridge the gap between character and plot with thematic issues consistent within particular contexts. Previous articles in this series on Preparing to Write a Complete Story covered the creation of inequity, and its resolution within the Story Goal. They also explored the Story Consequence as a counter-balance to that Goal and dove into the concept of Protagonist and Antagonist as motivating force, rather than an indicator of right or wrong. This article seeks to expand those understandings of the major story points by moving away from the static concerns of plot and plot resolution. Effective thematic exploration looks to the juxtaposition of strongly argued equally-balanced points-of-view. Creating a Storymind for the Audience to inhabit, instead of preaching or telling them how things are–as in The Passion of the Christ, Sicko, or Okja–increases the acceptance level of the story, while providing the Audience with a greater understanding of how to solve problems. Whether creating or analyzing, the process of building the foundation for a story remains the same: Identify the sources of conflict that generate problems for the characters. Once you know where the conflict lies, you can begin to appreciate how potential resolution plays out. As these four areas represent the totality of conflict, a functioning, and complete narrative will find a way to address each one of them. A riot on the streets is a problem. The marching, shouting, conscripting, and disruptive protests appear to be problematic Activities. A different Author, however, might choose to focus on the power play between social classes and see the riot as a problematic Situation. Another might focus on the prejudice or panic surrounding heightened Fixed Attitudes. And still another might look to the pretending, coercing, and subversive manipulation by the movement’s leaders to generate problematic Manners of Thinking. No one answer is correct, no choice better than the other. But a decision must be made, for if the Author decides to bounce from one area to the next, thematic concerns and plot elements shift as well. While the attitudes and approaches of the characters might work well as issues within problematic Activities, they matter little in Manners of Thinking. Likewise, rationalizations and obligations mean a great deal when looking at problematic Manners of Thinking, yet possess no obvious connection with Activities. Directionless narratives fail to keep thematic issues and plot concerns within the same family. They bounce the Audience around needlessly, promising one story and delivering another. If those four areas represent the totality of conflict, then how does a story account for all of them, regardless of the Author’s initial focus? To maintain integrity within the thematic exploration of a narrative, a consistent perspective–or context–must preside over the area of conflict. Functioning narratives find a way to address all four areas, not by shifting context and looking at them one at a time, but rather by looking at each through a consistent framework known as a Throughline. In the Dramatica theory of story, the Throughline of a narrative is a perspective, not a character, nor a plot line. Many other understandings of narrative refer to “A” storylines or “B” storylines as if the overall plot of a story somehow holds prominence over any others. In Dramatica, it is the relationship between the Throughlines that is important, not the subject matter explored in each one. The Overall Story Throughline looks at conflict from a dispassionate They perspective, as in Their fighting involves two sides fighting and punching and kicking each other. The Main Character Throughline looks at conflict from an intimate first-person I point-of-view, as in I am guilty and responsible for all the fighting because I inadvertently started it. The Influence Character Throughline looks at the problematic conflict generated from a first-person You perspective, as in You never shut up! The Relationship Story Throughline looks at the kind of conflict that drives a relationship forward (or backward) from an intimate We perspective, as in We used to be such great friends. Four areas of conflict. Four perspectives providing context. A complete narrative addresses all four areas by attaching a different consistent meaning for each one. Maintaining that contextual awareness of an area of conflict guarantees thematic integrity. Issues and concerns, while dynamic in their development, remain locked and identifiable within a consistent context. The examples above source from Captain America: Civil War. 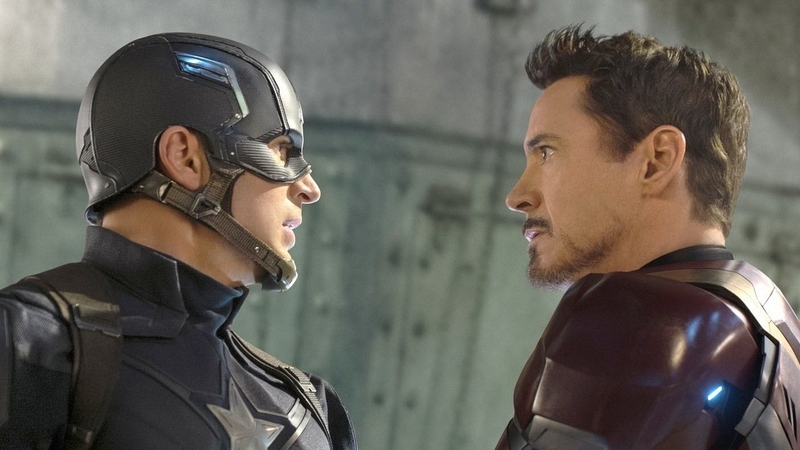 Superheroes fighting each other in the Overall Story Throughline, Tony Stark/Iron Man as the man responsible for Ultron in the Main Character Throughline, Steve Rodgers/Captain America and his undying support for what’s right in the Influence Character Throughline, and the dysfunctional friendship between Steve and Tony in the Relationship Story Throughline. With all four possible perspectives accounted for and all four areas of conflict covered, narrative functions as one complete argument. When it comes to identifying the source of conflict within a single Throughline, one can always make an argument for any one Domain, or area of conflict. The trick is making an argument for all four Throughlines at once. Luke Skywalker, in the original Star Wars, could be seen as having a problematic attitude (I wanted to go into town to pick up some power converters! ), a set of problematic activities (Sand people? Let’s go have a look…), or a problematic manner of thinking (Look around, they could use a good pilot like you.). But the only Domain that works, while considering the Domains of the other three Throughlines, is a problematic Situation: (Luke is the son a great fighter pilot, stuck working as a moisture farmer on the edge of the galaxy.). Thankfully, balancing the four Domains does not require one to go through this process for each Throughline. Identify the source of conflict in two of them and the other two fall into place. Placing Luke Skywalker in the Situation Domain forces Ben Kenobi in the Fixed Attitude Domain automatically–an arrangement that feels right. Luke is stuck in a far off land; Ben is stuck with some pretty far off ideas. The two balance each other by bringing into the narrative two competing, yet somewhat similar, areas of conflict. The same relationship between Main Character and Influence Character Throughlines exists in How to Train Your Dragon. Hiccup is a Viking stuck in the body of a wimpy 98 lb. Weakling, his father Stoick is a Viking stuck fighting for old and weak ideas. Both alike in their relative weakness of position, both different in how that weakness plays out through conflict. As you can see, selecting the Domain of conflict for the Main Character Throughline selects the Domain for the Influence Character Throughline automatically. Making one more selection–typically for the Overall Story Throughline as it is usually the easiest to identify–forces the other two into positions necessarily to balance out the narrative. Both Star Wars and How to Train Your Dragon find conflict in the Overall Story Throughline through problematic Activities. The fighting of Dragons, the trials of training new Viking Dragon-killers, the struggle against the Empire, the trials of testing out new weapons on entire planets–all of these focus on conflict in the external realm. Maintaining that diagonal relationship with the Overall Story Throughline places the Relationship Story Throughlines of these two stories in the Domain of Manners of Thinking. Father and son hash it out over an incredible shift in power while mentor and mentee hash it out over living in the moment and being one with the Force–both finding conflict within the inner realm. Choose the source of conflict for the Main Character and Overall Story Throughlines, and the narrative model will determine the natural counter-balance found in the Influence Character and Relationship Story Throughlines. In Captain America: Civil War colleagues and friends face off against one another in spectacular battles. The Overall Story Throughline covers the colleagues portion of that statement, the Relationship Story Throughline the friends part. By placing the area of conflict for the Overall Story Throughline in problematic Activities–which sounds right for a story about superheroes physically one-upping each other on the battlefield–the area of conflict for the Relationship Story Throughline falls into Manners of Thinking. The friendship between Steve and Tony (Captain America and Iron Man, respectively) splinters from the inside. The internal dysfunction between them mimics the external dysfunction between the opposite sides found in the Overall Story Throughline. The attempts to manipulate one another to think differently find a relation in the attempts to physically force everyone to work differently. A similarly balanced relationship exists between the Main Character and Influence Character Throughlines. Tony is the man responsible for creating the robot that killed so many lives. Captain America is the man responsible for standing up for what is right during tumultuous times. Both stuck with labels they can’t escape; one finding inequity in the external, the other through the internal manifestation of that label. Gaining a comprehensive understanding of the various Throughlines, one begins to derive a sense of what it feels like to write a whole story. Contrarily, one can skip over one or two of the Throughlines, or shift context to different points-of-view, and start to appreciate what it feels like when a story lacks clarity. Balancing all four Throughline perspectives at once guarantees that feeling of completeness.